The Boston Red Sox have won the first World Series game against the Colorado Rockies with an impressive 12 run lead. Will the Red Sox repeat their 2004 win when they broke the 86-year “Curse of the Bambino”? Or will the Rockies redeem themselves with a comeback? Well, grab an all-american hot dog, watch the game, and support your team by choosing either a Boston or Colorado bean side dish recipe. Boston is famous for baked beans, but did you know that Colorado is nationally recognized for its production of dry beans? The rocky mountain state produces a wide range of varieties including pinto, light red kidney and navy. Beans are great for healthy eating because they’re high in protein and dietary fiber, and low in fat and sodium. So, will it be Boston Baked Beans or Colorado Refried Beans that make your baseball night a success? Who knows, if you’re superstitious, you might just lead your team to a delicious victory! 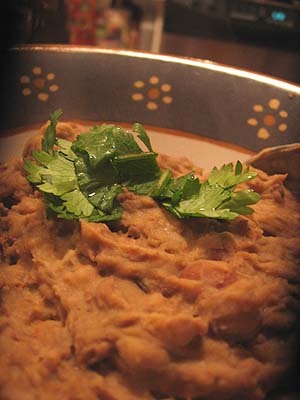 Discard any discolored beans. In a large bowl, combine the beans with plenty of cold water and soak overnight for 6 to 8 hours. Drain the beans. In a large pot, combine the beans and enough water to cover them by 1 inch. Bring to a boil, lower the heat to simmer, and cook for 45 minutes or until they are just tender (it may take longer if the beans are old or the soaking time was short). Drain the beans and set aside the cooking liquid.Set the oven at 325 degrees. In a bean pot or deep casserole with a lid, combine the beans, onion, mustard, dark and light brown sugars, molasses, and salt. Add enough of the cooking liquid to just cover the beans. Stir to blend them. Bring the liquid to a boil on top of the stove, then transfer to the oven and bake for 2 hours, checking every 30 minutes to make sure the beans don’t dry. Add more cooking liquid if necessary.When the beans are tender, uncover the pot and cook for 20 to 30 minutes more to make a slightly crusty top. Cover beans with cold water and soak overnight. Drain beans and place them in a saucepan, cover with cold water. Bring to a boil and reduce the heat to a simmer, and simmer until tender (about 45 minutes). Drain and cool. In a food processor, chop garlic and the jalapeno. Add beans and with the motor running, process while slowly adding the water and oil through a feed tube. Add remaining ingredients and process until smooth. For more healthy eating recipes , check out the other delicious recipes listed on this blog or visit Green Mountain Healthy Living Recipe Favorites. I definitely choose the Boston Baked Beans. Go Sox! But otherwise, thanks for the good healthy recipes.